Many people give to charity instead of sending paper Christmas cards. We do it too. This charity is a crowd-funded bank that lends money to African entrepreneurs. Ten people donate £10 each and the charity lends £100 to start a business. £100 goes a long way in Africa. This is Mmalemna Ayam. 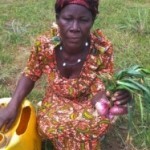 She wants a loan to grow and sell more onions to help feed her family. When she repays our loan, we can lend it again to someone else. And you can buy gift vouchers, so your family, friends, and important acquaintances can help more entrepreneurs work their way out of poverty. When you’ve visited Deki’s site and made your investment (or even if you haven’t), come back and leave a comment on this page. Comments increase the authority of a page like this. The more comments, the greater the authority. That increases the value of our link to Deki. This entry was posted in Wider Internet Issues and tagged charity, Christmas card, deki on December 13, 2016 by Dave Fielden. E-cards seem like a cop-out to traditionalists, fine for a later generation. This can be true if you send the same card to everyone on your mailing list. it saves time and fuel, as you don’t need to go buy and post them. Now you can donate the money you’ve saved to your favourite charity! Our e-Christmas card is personal, one for each recipient. We send individual emails, with a link to a single page containing a general message for all recipients. We personalise it using a “to=” parameter. If you click this link, you’ll see an example. We can change some of the text on the web page using our Content Management System, or CMS, but it changes for everyone. The individual message is in the email and the parameter. The “to=” parameter is too complex for the CMS. However, you can easily make an on-line e-card of your own, and keep the personal message for the email. We’ll post more on how to do this later. This entry was posted in Wider Internet Issues and tagged Christmas card, e-card, environment on December 26, 2012 by Dave Fielden.